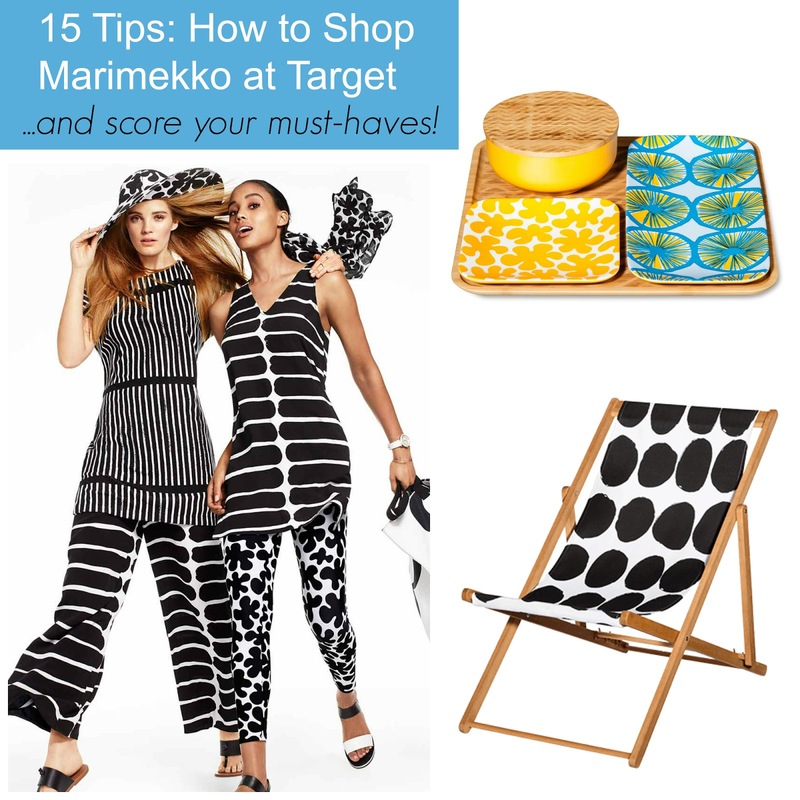 Tracy's Notebook of Style: 15 Tips to Shop Marimekko at Target THIS Sunday! Write down everything you love and make note of anything that is "online only" listed on their website under "availability" on selected items. Prioritize your favorites! Let's say you have 20 things on your list, you might not be able to get every single thing, but getting the top three favorites will probably be better than getting ten random pieces you weren't even sure you wanted anyway. All Target stores will carry the collection, however selection and styles will vary by store. Call ahead to see if your store will have the specific item on your list or on the day of the launch, check the store locator listed under the item, although it's not always 100% accurate, you can still use it as a guide. After you created your wish list, add prices and think about what you might actually need for your fall wardrobe that you will wear all season long. I always delete everything in my cart prior to launch since having other items already in your cart could slow down the checkout process (an error message can appear that "too many items are in cart" and it will prevent you from adding the Adam Lippes items) Make sure you are logged in and enter your credit card info and "save" it so you are ready to go. Please do this hours before the launch because websites will be "on maintenance" or disabled to get ready for the big launch. Remember, you can place multiple orders with either free shipping if you are a REDcard holder or free shipping on orders of $25 or more because once those items are gone, they're gone. You might get lucky finding returned merchandise at a store, but don't take that chance if it's something you really want. Since sizing can be tricky (especially with online items you haven't even seen! ), you'll want to make sure at least one of the items fits correctly and the best way to ensure that happens is to order the two sizes you might wear. Target has the easiest returns, so don't hesitate. As far as prints go in the home decor, I'd do the same thing if you like two colors, you never know how the colors might differ in person. I usually end up placing two orders with the designer collections, the first one includes my must-have items that I don't want to risk losing by continuing to shop. The second order are the items I was considering and are still available (yay). I say this all the time (also my golden rule for shopping Black Friday), but checking out fast and not over-thinking something is the only way to shop these launches, this is not the time to be indecisive. Do not start shopping non-Marimekko items because they can disappear in a second even if it's in your cart! Target never announces the exact time of the online launch, basically to avoid their site crashing, unfortunately it still usually crashes at some pint (let's not even talk about the Lilly launch that still haunts us! ), be patient. I start checking their website online at 9pm, then again every hour on the hour, although it generally launches between 12 midnight and 2 am, painful I know. You probably stayed up late the night before shopping those online exclusives, but choose another time to catch up on your sleep and grab a coffee, thankfully Starbucks is available at most Target stores. Depending on what area you live in, there might be lines in major cities, and arrive 15-30 minutes early if you have anything on your wish list you do not want to miss. I'll be getting there when the store opens at 8am since I don't have a huge wish list. I shop at a Target that is close to four more locations! That way, if one store doesn't have what I'm looking for, I can quickly move on to the next location for more merchandise. Larger stores like "Target Greatland" carry a wider selection of clothing in general and the inventory is better overall. However, sometimes checking a smaller store is also a good idea since you might be one of the few customers shopping the collection, it's happened to me more than once. This collection follows the 14-day return policy previous collaborations at Target have had. If you aren't thrilled with your purchase, maybe waiting for clearance is a better option for you, if you don't love it, don't keep it. Clearance markdowns are usually four weeks after the launch date (sometimes sooner if they aren't selling or there are only miscellaneous items left). I opened up a REDcard years ago when Missoni launched to take advantage of free shipping (with no minimum! ), 5% on all orders, and an extended return policy. Be the first to shop the collection online by checking social media. While I have Target's Website up (I continue refreshing the page), I also have my phone next to me checking Instagram using the hashtag #marimekkofortarget (and other variations), Twitter to follow The Key To Chic , and Facebook on Target Style's page here. Sometimes links to items go up before the "official" launch and you can score items early. It seems like half the stores were selling fast, while others it was crickets, it's always interesting to see the popular items, it was a nice collection overall. You can buy ATV Accessories directly here.